It's easy to forget that simple is usually the best but this recipe will remind you. 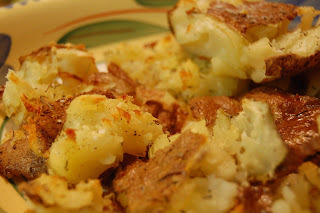 Crash Hot Potatoes, from The Pioneer Woman Cooks, is simplicity at it's finest. Find some potatoes. Boil them. Flatten them. Sprinkle with olive oil, salt and freshly ground pepper and any herbs you'd like and bake. 450 degrees. Twenty minutes. Seriously, that's all there is to it. They are deliciously creamy on the inside and crusty-crunchy on the outside. Delicious. If you need more direction or want step by step photos and instruction, check out the original recipe over at The Pioneer Woman Cooks, check out her recipe for Bacon-Wrapped Jalapeno Thingies. Delicious! 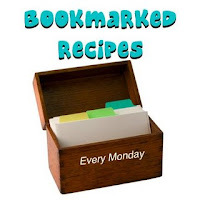 Since I had this recipe bookmarked all summer before I got around to trying it, I'm submitting it to ththis week's Bookmarked Recipes event over at Ruth's Kitchen Experiments. Hi! Just hopped in from Bookmarked Recipes. I like this fast and easy potatoes. Thanks for sharing! These sound incredible. I've made similar before but not smashed them before baking - I really have to try this!!! !